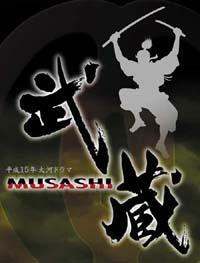 Many are familiar with "The Book of Five Rings" which was written by Miyamoto Musashi in the 17th century. Musashi's treatise on strategy and the way to lead instantly became the business executive's bible when the translated version hit the bookstores more than three hundred years later. Now, the story of this legendary swordsman-philosopher-painter comes to life in the 2003 NHK Taiga Drama "Miyamoto Musashi." Based on the famous biography written by Yoshikawa Eiji, this year's drama boasts a list of stars that reads like a Who's Who of screen and television. Among them: Fujita Makoto, Emori Toru, Nakamura Kankuro, Nakamura Tamao, Miyazawa Rie, Watase Tsunehiko, Takashima Masanobu, Tsutsumi Shin'ichi, and Katase Rino. The younger generation is well represented too, with stars like Matsuoka Masahiro, Yonekura Ryoko, Nakama Yukie, Uchiyama Rina, and Masuda Takahisa. Kabuki actor Ichikawa Shinnosuke, who has enthralled theater audiences since his debut, will no doubt win over many television viewers with his portrayal of the strong and enigmatic Musashi.